Much of the depth of the Babylon 5 series is evident in episode titles. Consider this example: And All My Dreams, Torn Asunder. It is poetic yet functional. You might ask, “Whose dreams are torn asunder?” The answer: Londo Mollari, Vir Cotto, G’Kar, Delenn, John Sheridan, and all who desire peace. There are at least two kinds of war: those of necessity and those of choice. 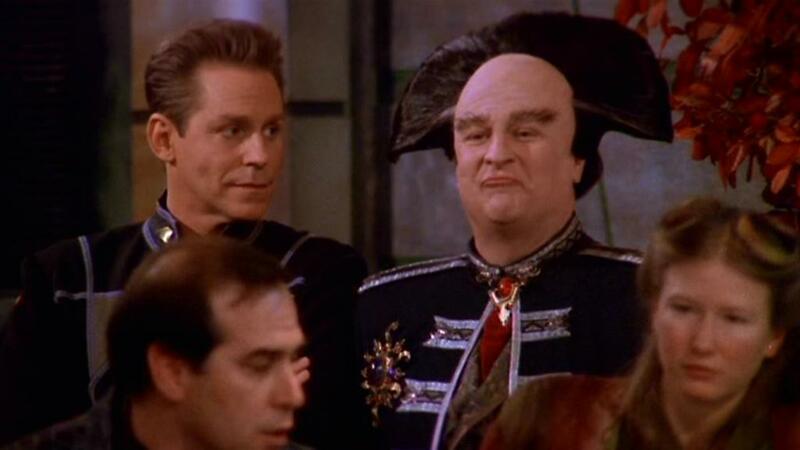 The Centauri War of the latter part of the fifth season of Babylon 5 is a war of choice. And it has devastating effects, especially for the Centauri people. Sheridan opens a council meeting to share with Alliance ambassadors the evidence against the Centauri. Dr. Franklin, Michael Garibaldi, and Lennier testify while Londo Mollari, in his quarters, reviews their prepared testimony. Much of the evidence comes as a shock to Londo, who has not connected the dots despite seeing what has taken place around him. His blindness is psychological and not malicious, but it is something he can no longer maintain. 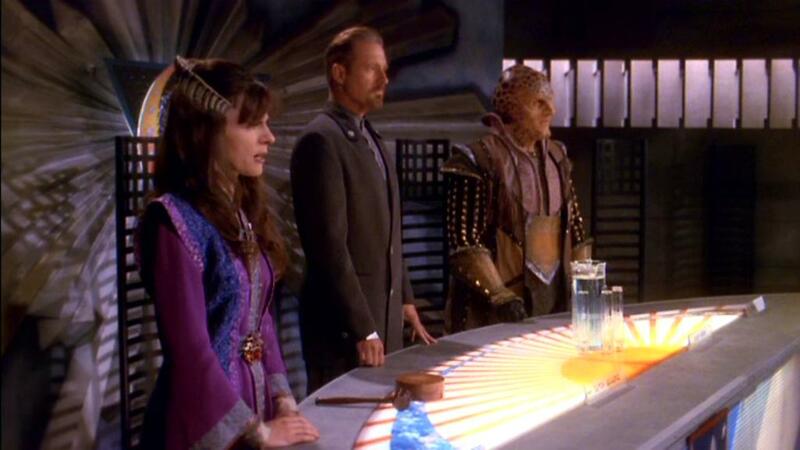 G’Kar visits Londo, who is awaiting a summons to the council chamber. The Narn Ambassador reminds the Centauri Ambassador gently of all the hints that something was terribly wrong on Centauri Prime. 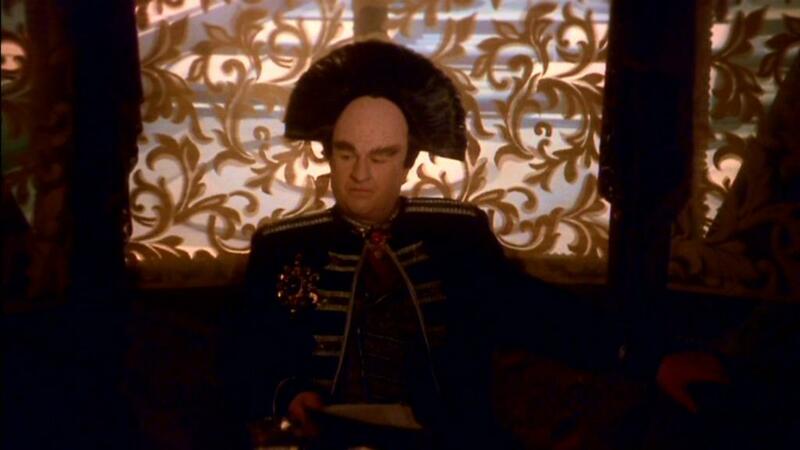 Once inside the council chamber, Londo denies any Centauri involvement in the attacks on shipping. He is still the Ambassador, and this is the stated position of his government. Then Sheridan unveils the most devastating and convincing proof: Lennier’s video of the recent attack. Based on the look on Londo’s face, he knows that the video is genuine. 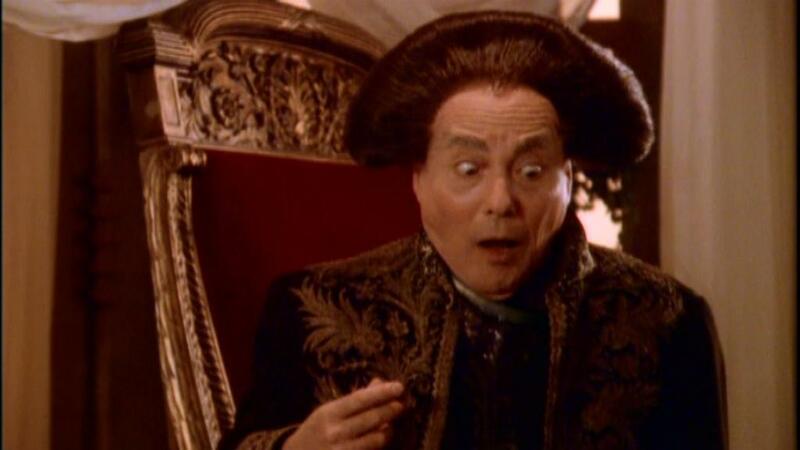 A few hours later, Londo hears back from Centauri Prime. The Regent has declared the video either a fraud or footage of an event staged to frame the Centauri Republic. Either way, the Centauri nation is innocent. 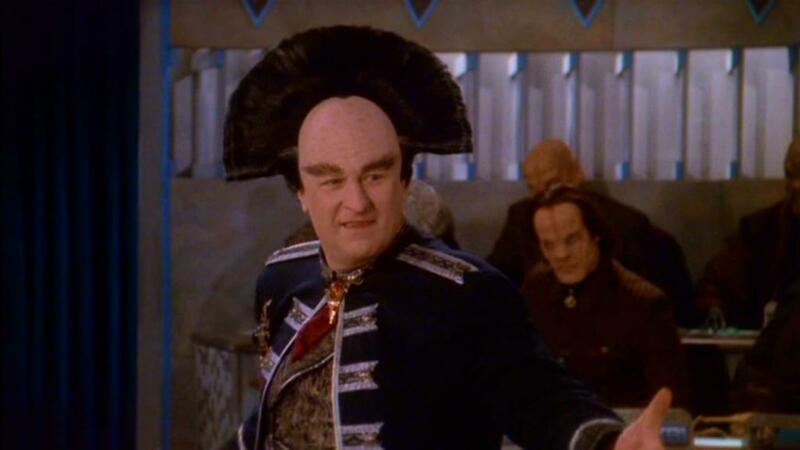 Londo, ever the dutiful ambassador, reenters the council chamber and announces that the Centauri Republic refuses to recognize the legality of Interstellar Alliance blockade of the Centauri Republic, that the Centauri Republic is withdrawing from the Alliance, and that Centauri warships will accompany Centauri transports and fire on anyone firing on them. 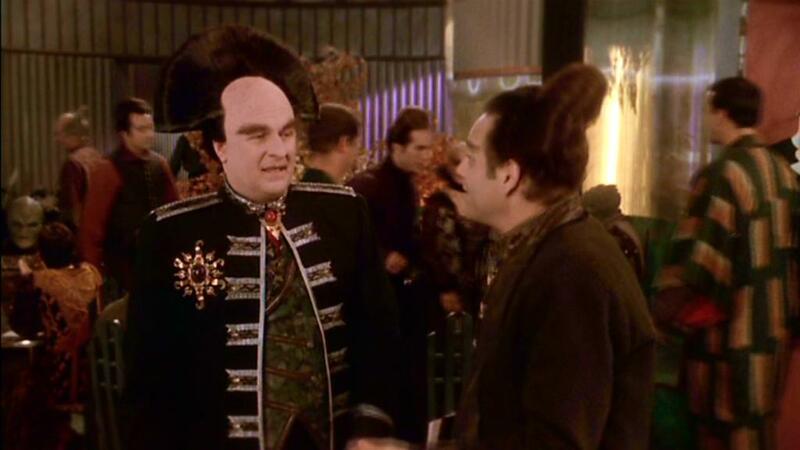 There is now a state of war, and Londo departs Babylon 5 for Centauri Prime, never to return, and G’Kar accompanies him as a bodyguard. 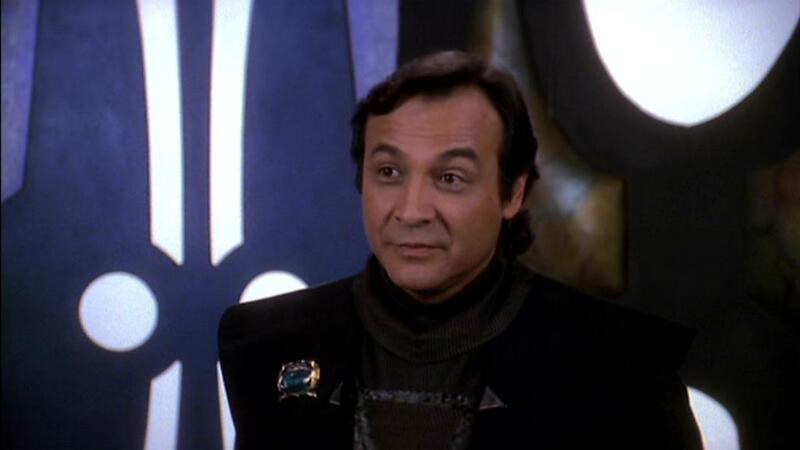 Vir Cotto is now the de facto Centauri Ambassador to Babylon 5. For over an hour President Sheridan has been unable to reach Michael Garibaldi, his chief of covert intelligence. Station security chief Zack Allan finds Garibaldi in his quarters, drunk. Allan, out of friendship, agrees to keep the secret. He should have told Sheridan immediately, though, for Garibaldi’s alcoholism is about to have a body count. Sheridan assigns White Star ships to form a buffer between Centauri warships and the fleets of Alliance member worlds. He stations White Star vessels along trade routes and tasks Garibaldi with receiving messages from White Star ships observing any potential confrontation. Then Garibaldi is supposed to make sure that enough White Star vessels can arrive in time and prevent an attack. The only problem with this plan is Michael Garibaldi, who is passed out, drunk, when a White Star checks it. The captain decides to do what he can, but that is insufficient to prevent an attack. We gave you a promise, and we are bound by that promise.” And damn you for asking for it! And damn me for agreeing to it! And damn us all to hell, because that is exactly where we are going! We talked about peace. You didn’t want peace! We talked about cooperation. You didn’t want cooperation! You want war! Is that it? You want a war? Well, you have a war! 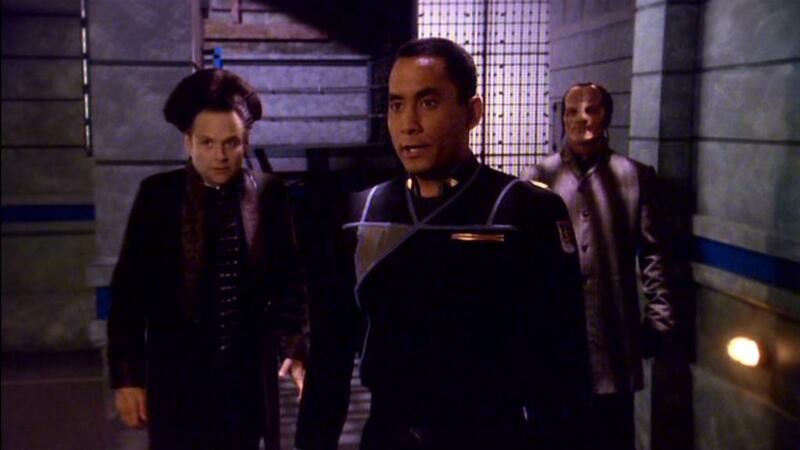 Dr. Franklin has to protect Vir Cotto from angry Brakiri, who seek to scapegoat him for the recent Centauri actions. Vir, of all Centauri, is the least likely individual to blame for aggression, but blind rage is inherently irrational. Back on Centauri Prime, palace officials place G’Kar, a member of the Advisory Council of the Interstellar Alliance, under arrest. Londo declares that the guards will have to arrest him, too. They do. 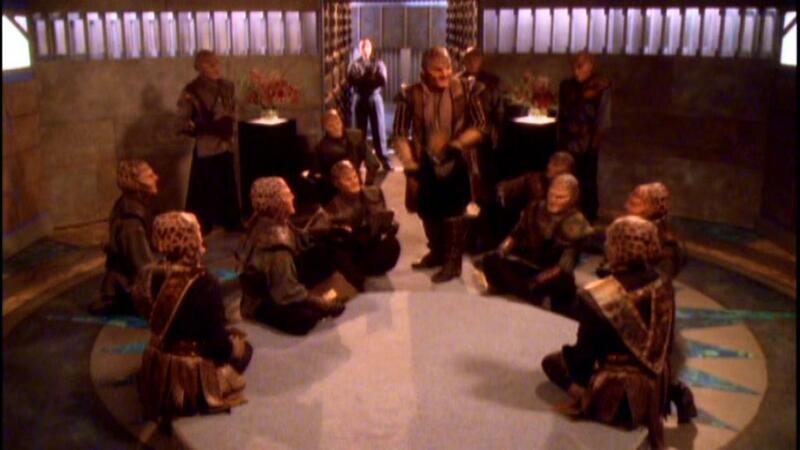 As member of various species die in the new war, Sheridan and Delenn pray. And, as the end credits roll, we viewers know that worse is to come. 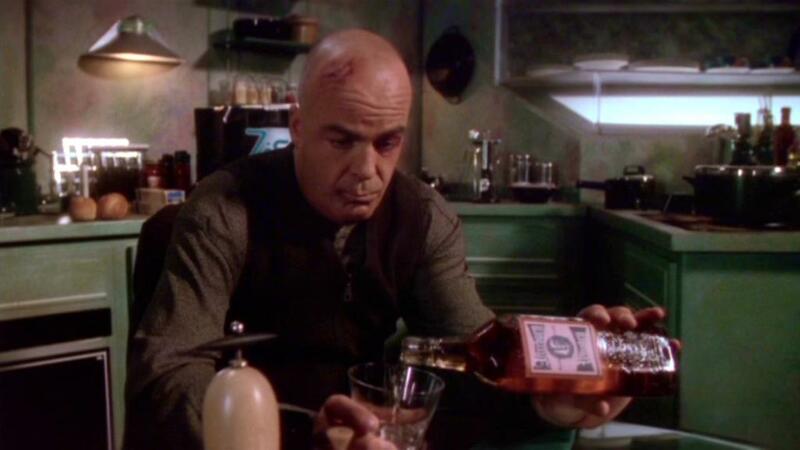 Part of the great depth of Babylon 5 is that its writers and show runners did not shy away from dark territory. Neat, happy endings do exist here. Actions have consequences, even years down the road. Coming out this episode, Garibaldi and Londo Mollari–especially the latter–will each face a reckoning. Yet both maintain much nobility in doing this. Neither man is a simple character, and we viewers want to like them, often, despite themselves. All images are property of Warner Brothers, and I do not profit from said images. For those who found the first half of the fifth season slow, the payoff comes in the second half. And the payoff is quite rewarding–and sobering. War descends upon the Interstellar Alliance in this excellent episode, which is replete with emotional moments. 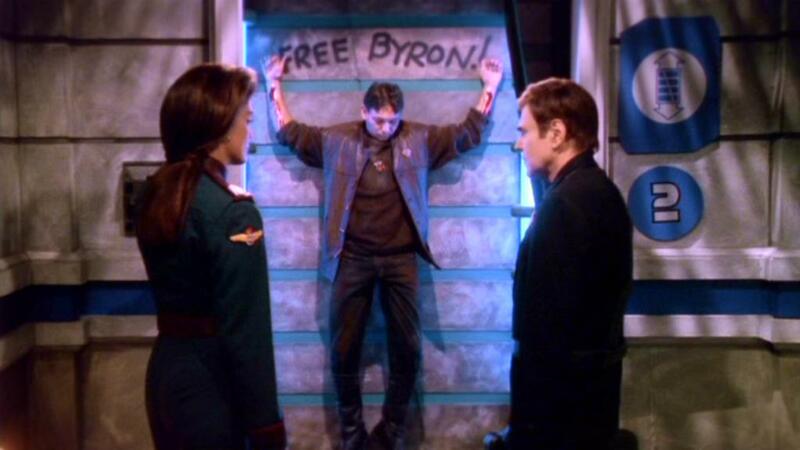 There the Babylon 5 series finds its greatest strength. As George Lucas has said, a special effect without a story is boring. And the best stories involve emotions. A minor yet pivotal element in this episode concern Lyta Alexander’s attempts to secure funding for her effort to aide rogue telepaths. She negotiates with a representative from a large corporation (depicted above) yet fails, for his employer hires only telepaths registered with Psi Corps. Anything else would be too risky, according to the corporate insurance policy. 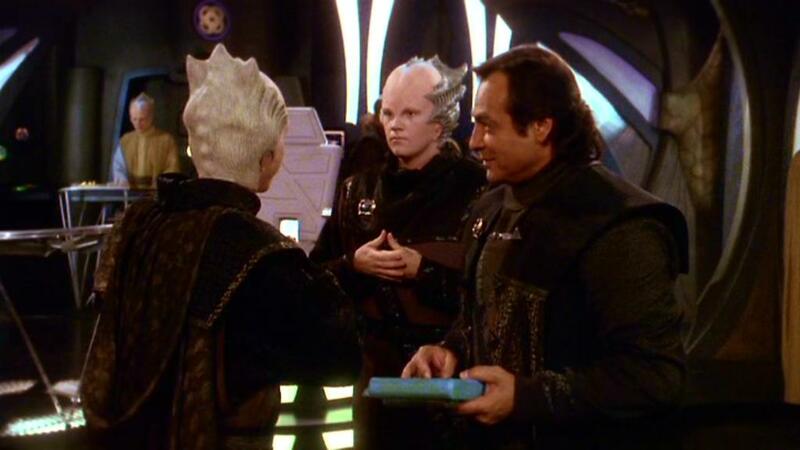 So Lyta cashes in a five-year-old offer from Ambassador G’Kar, who, in The Gathering, the 1993 pilot movie, offered money in exchange for telepath DNA. The Narns have lacked telepaths for a thousand years, and their government seeks to remedy this situation. 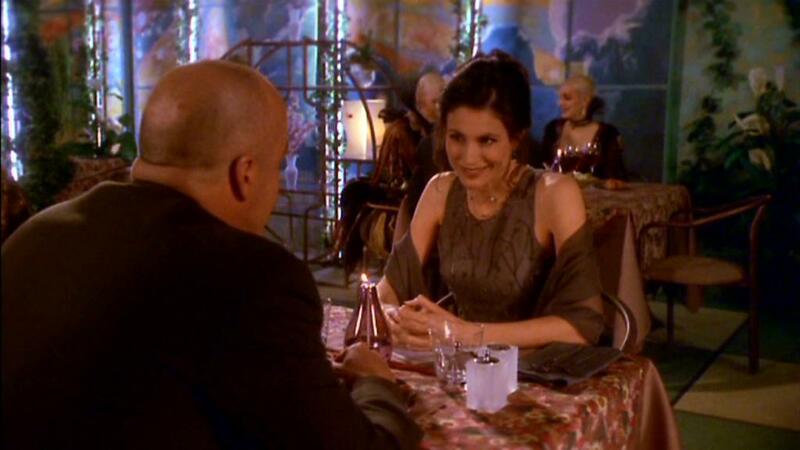 Aside: It pays to listen carefully to dialogue in Babylon 5, for one never knows on the first viewing when the script writers will pay off a plot thread. The serialized nature of the series contributes to much of its greatness. Garibaldi wakes up to see Lise Hampton-Edgars, his on-and-off girlfriend, enter his quarters. 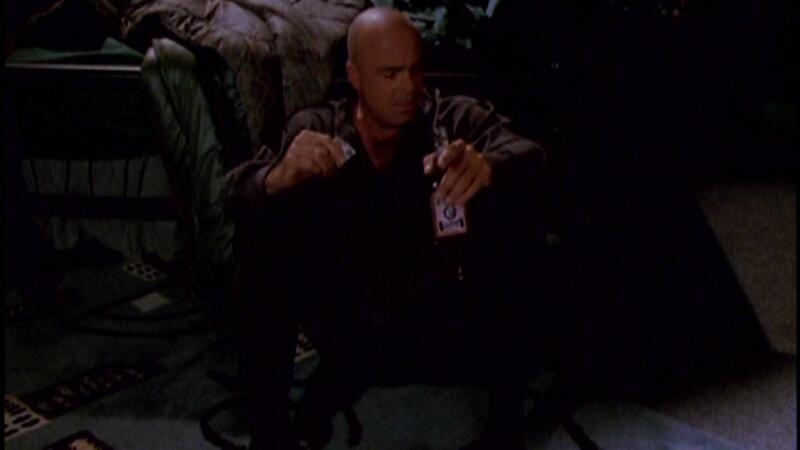 Over half a year ago, he had left Mars for Babylon 5, saying that he would be right back. So she is back, to find him. Later, Lise discovers alcohol in Garibaldi’s quarters. She confronts him, and he tells her that he has it under control. To demonstrate this, Garibaldi pours alcohol down the kitchen sink. Garibaldi take Lise out to a nice restaurant. There he maintains his ruse of having drinking under control. He does sneak out (giving an excuse) so he can pour some alcohol into allegedly bad coffee. Garibaldi’s drinking will have devastating effects on others in the short term; stay tuned and keep reading. Centauri Ambassador Londo Mollari and his aide, Vir Cotto, discover that their daily schedule is open. Other governments have canceled their meetings. They suspect Centauri involvement in the attacks on shipping convoys, and the Centauri diplomats have become quite unpopular. Londo suspects something, too, but he does not look upon it too closely. Actually, reality is worse than most people suspect. How is that for a depressing thought? 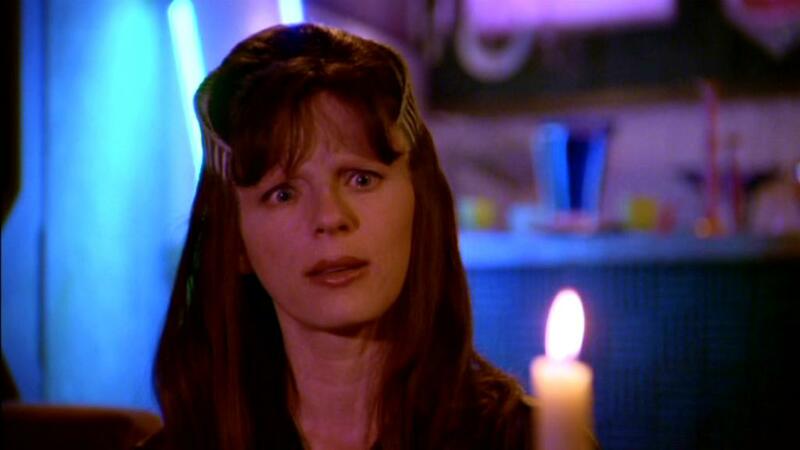 Delenn communicates with Lennier. She is unaware that Sheridan happens to walk by during this conversation. This is how he learns of the Ranger trainee’s secret mission. Meanwhile, on the Maria, Captain Montoya speaks to Lennier. 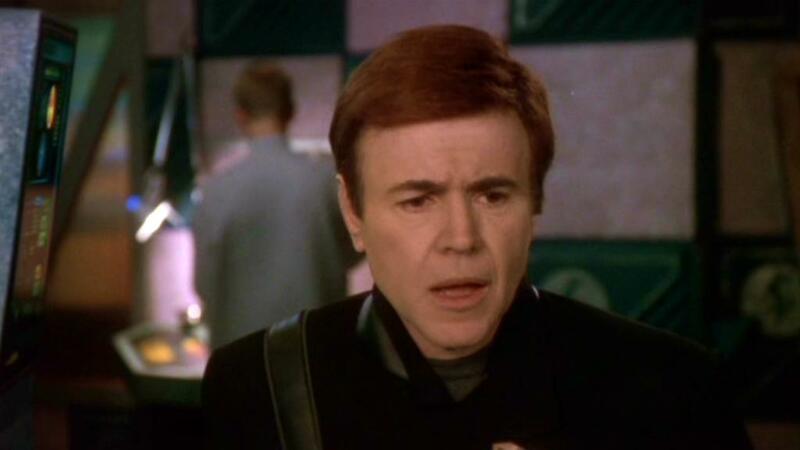 The Ranger trainee explains his interpretation of intercepted Centauri transmissions, which translate as, “Do not respond.” Lennier explains that these must be transmissions from ships to a base, the location of which is a military secret. Montoya agrees with Lennier’s thinking. 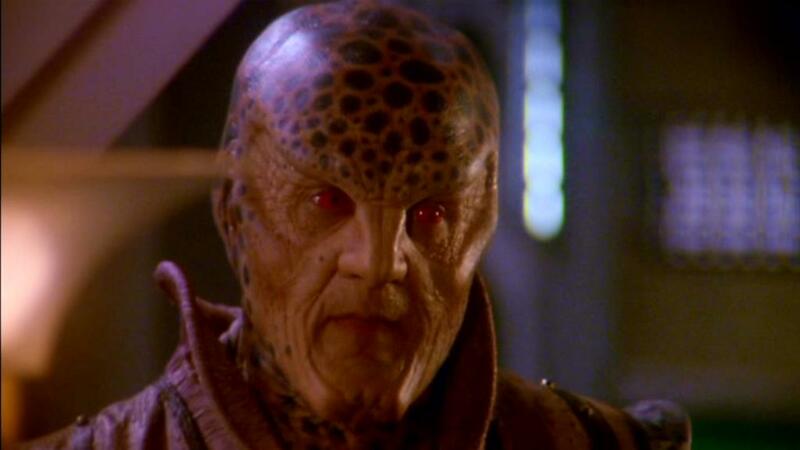 The captain cannot pursue the possibility, however, because he receives an order from President Sheridan for the Maria to return to Babylon 5. 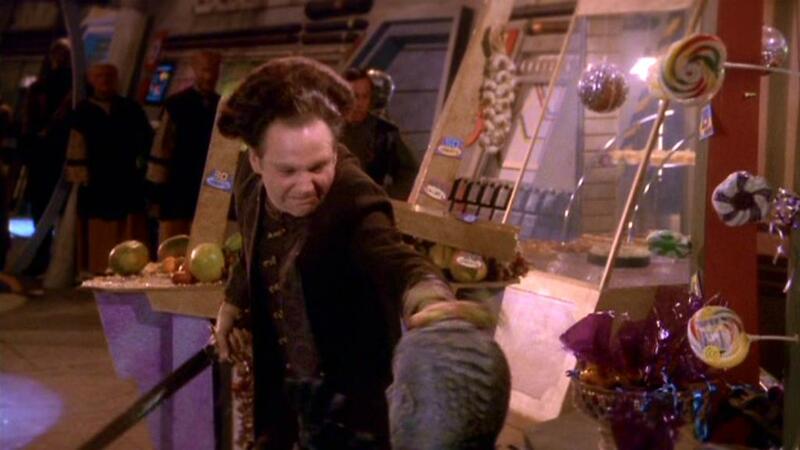 Montoya follows orders, and Lennier takes a fighter craft out without authorization. Montoya informs Sheridan and Delenn, who have avoided an argument over her deception. (It is difficult to have an argument about how inappropriate it was to keep the mission secret from Sheridan if Delenn agrees with him.) Lennier is in great danger of his air supply running out, so Sheridan and Delenn are concerned for his safety. Lennier’s gambit pays off. He attaches his fighter craft to the hull of a Centauri warship that passes by. 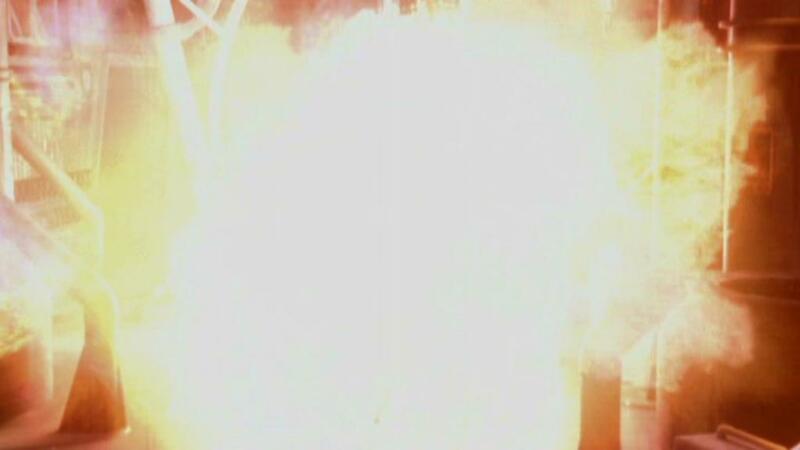 Lennier taps into the larger vessel’s air supply, thereby surviving. And he witnesses and records a Centauri attack on an unarmed convoy. After the attack, Lennier detaches his small fighter craft from the Centauri ship and hides among the debris until the Centauri ships leave the area. Then Lennier sends a distress signal and prays for all who have just died. 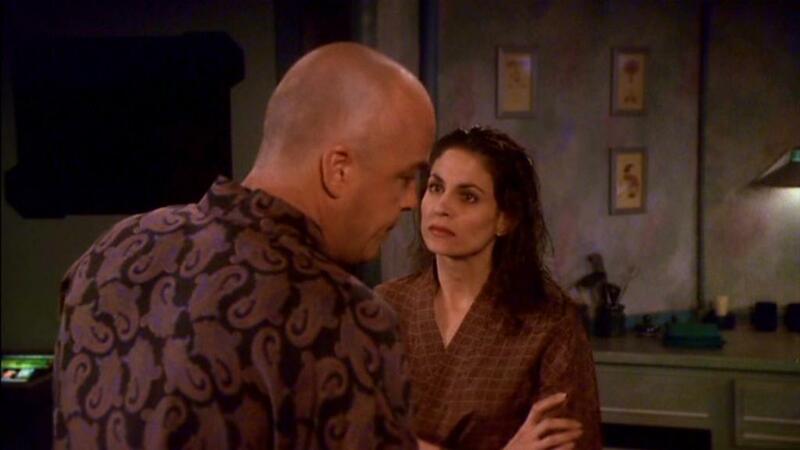 The Maria rescues Lennier and returns him to Babylon 5. Sheridan and Delenn thank him for the good work yet regret what they must do next. They must call a council meeting and share the evidence Lennier has collected. This will almost certainly mean war, for the Centauri government will deny involvement in these attacks. 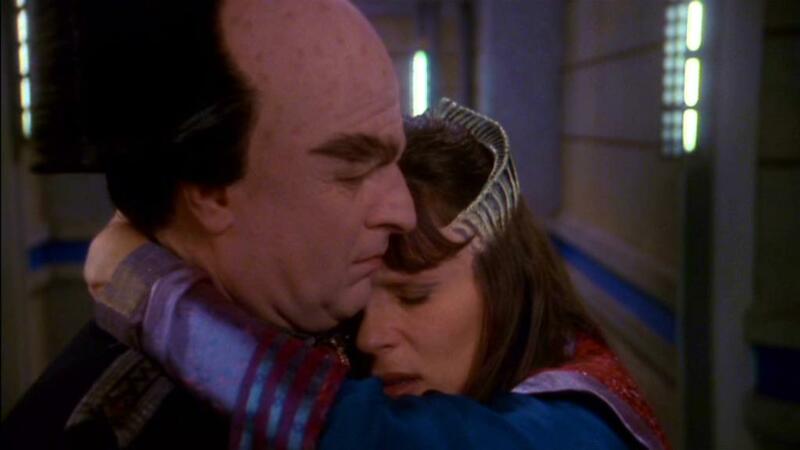 Delenn, stricken with grief, embraces Londo, who is just walking by. She has never done that before, and she will never have another chance to do so again quite soon. Aware of the threat if immediate war, Garibaldi tells Lise to take the next transport back to Mars. Events are about to take a devastating turn. People make mistakes, which have consequences. Sheridan, until recently, has been a professional soldier. A new politician, he underestimates the determination of traditional foes of the Centauri to take revenge on them. Out of principle and naivete, Sheridan has promised to support whatever action (short of bombing civilian targets) the victims of the attacks choose to take when the identity of the assailant is confirmed. This was a grave error, one which carries terrible consequences. In a previous episode, Captain Lochley quoted the cliche that the road to Hell is paved with good intentions. Sheridan asked, “Why does it have to run through this office?” I imagine that many real politicians have asked themselves the same question. 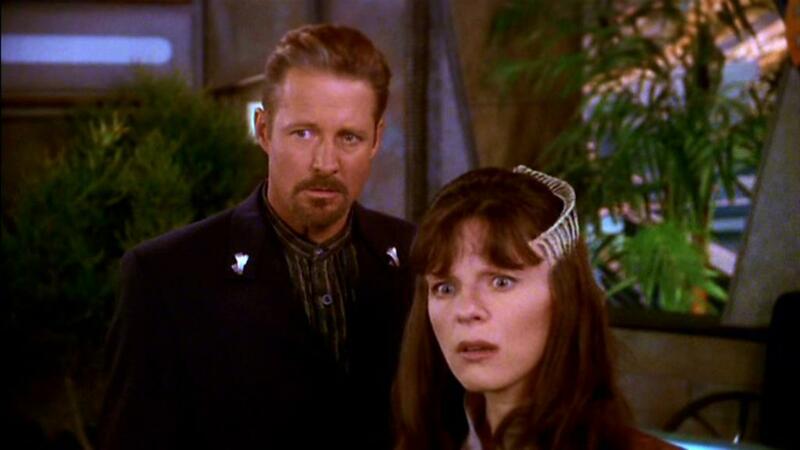 The Babylon 5 series enters its final phase with this episode, number 14 of 22 within the fifth season. It is time to wrap up some character arcs and pay off more foreshadowing. 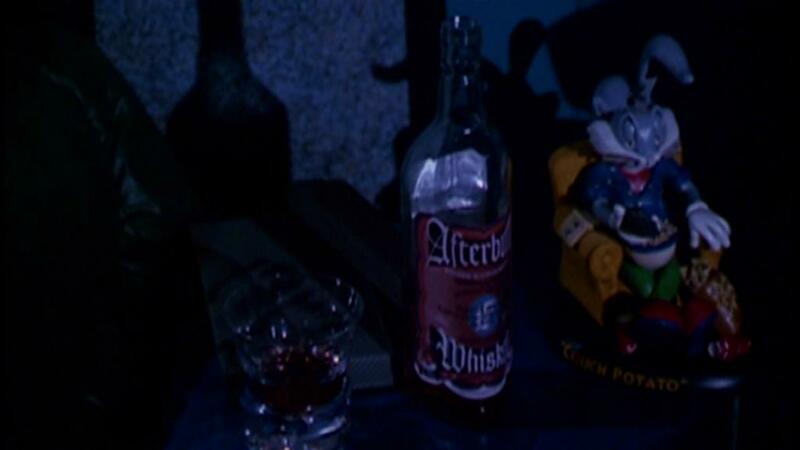 Meditations on the Abyss begins Lennier’s final journey (one with a sad end), take us to Vir Cotto’s next steps (which end happily), show us G’Kar attempting to adjust to his new life as a reluctant religious leader, and continue Michael Garibaldi’s descent into alcoholism. Perhaps the best way to approach this episode is to avoid a strictly chronological approach. We can’t be free until we learn to laugh at ourselves. Once you look in a mirror and see just how foolish we can be, laughter is inevitable. And from laughter comes wisdom. The Narn Ambassador, however, is at pains when he has to define truth as a river and God as the source of the river. 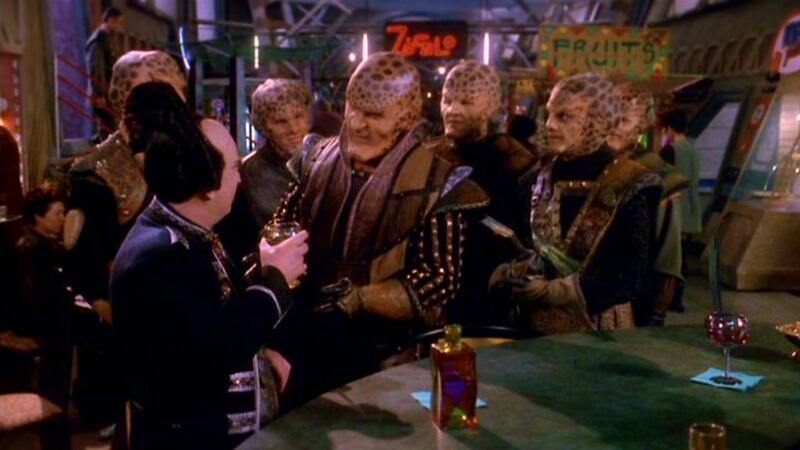 G’Kar never wanted all this attention, for he had intended to have his book published posthumously. Yet the Narn Ambassador does his best to help those who have come to hear him. LONDO: I’m sorry, Vir. I didn’t mean to sit on your supplies. I didn’t even see them. You should be more careful where you put things in the future. VIR: You’re right, Londo. I was wrong. It was a very silly mistake of me. LONDO: Now the thing you must remember about the Drazi is that they are a very insecure people, but they have so much to be insecure about. Did you know that the female of the species will gladly mate with the males of any other species to avoid the males of their own kind? Take the wife of the Drazi Ambassador, for example. After spending an afternoon with her, the Gaim Ambassador told me the most amazing stories. As you know, that one day she actually…. 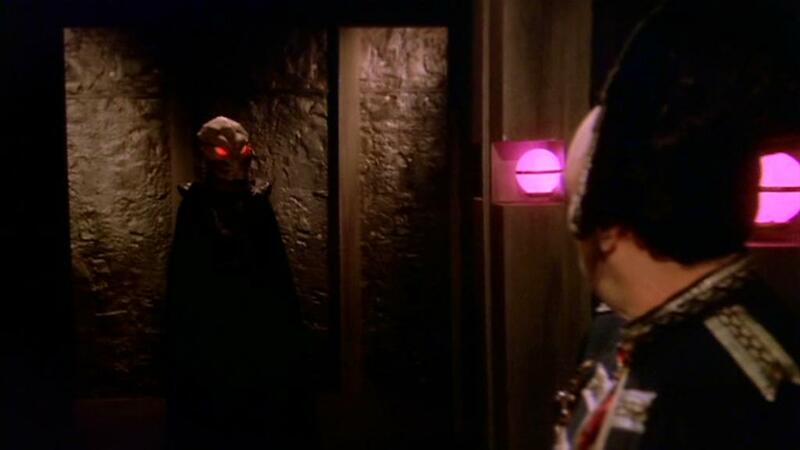 Later, Londo confronts the Drazi Ambassador about the bug. The Centauri Ambassador opens by saying, “So, Ambassador, how is the wife? Not too tired, I hope.” The Drazi Ambassador (pictured above) is not amused. One may presume that he had heard Londo’s disparaging remarks via the listening device. Now Vir is ready to serve as the Ambassador. 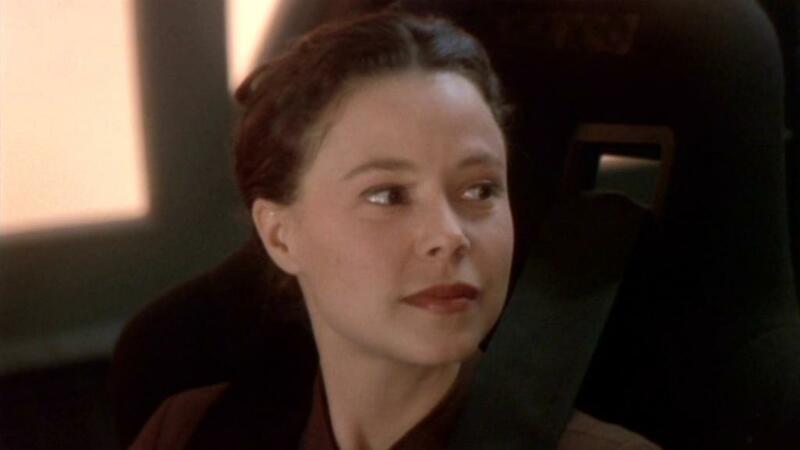 Delenn, a.k.a. 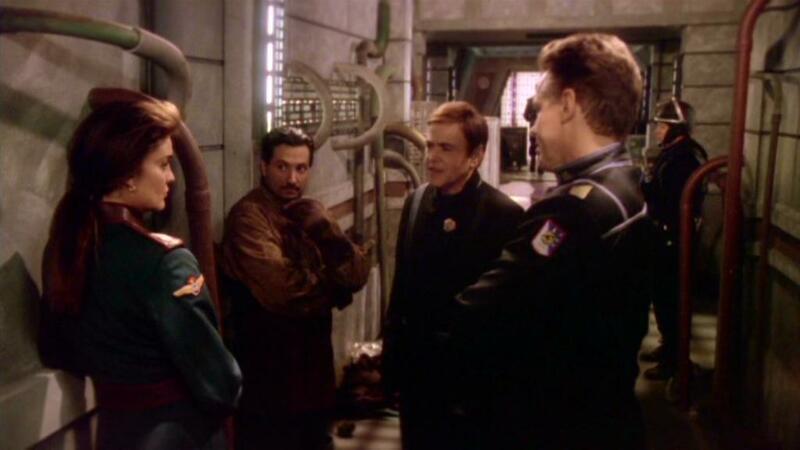 Ranger One, summons Lennier, her former aide and now a Ranger trainee, to Babylon 5. She does this very quietly, to keep the secret from her husband, President John Sheridan. 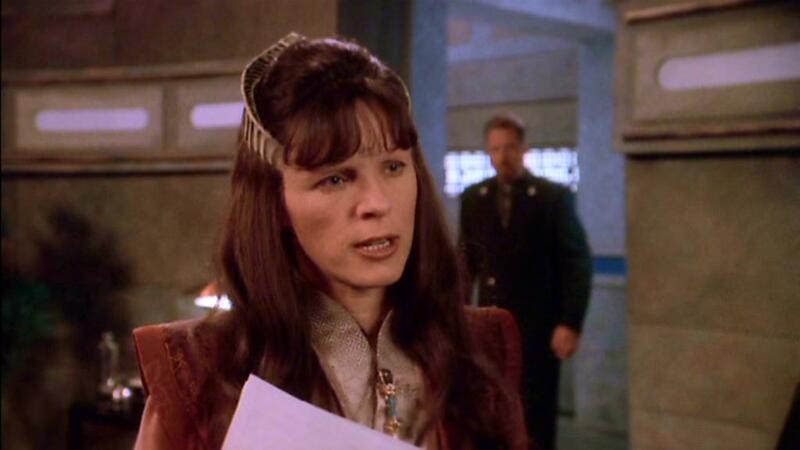 Delenn assigns Lennier to White Star 27, but tells only Lennier his actual mission, which is to seek evidence that the Centauri are involved in the recent attacks on unarmed shipping vessels. Captain Enrique Montoya, a capable starship commander, has dubbed his vessel the Maria, after his late sister. Montya sends trainees Lennier and Findell on a scouting mission. 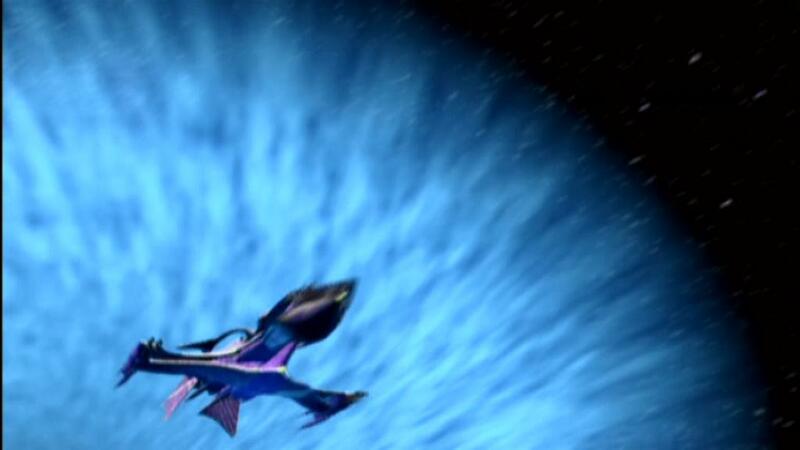 Immediately, Lennier and Fendell, each in a separate fighter craft, watch the Maria return to hyperspace. The two trainees know that they have about an hour’s worth of air, as opposed to the nearly 7 hours’ worth of air. 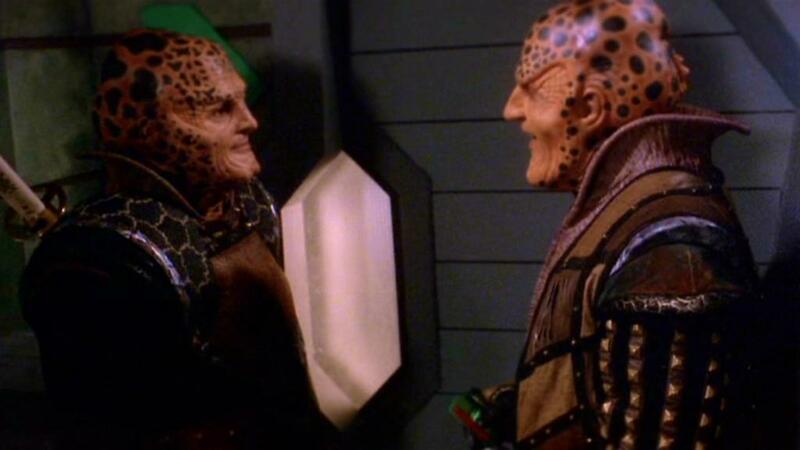 Lennier knows how to adapt to the situation and offers to help Findell, who refuses assistance. The Maria returns just in the nick of time. Montoya tells the trainees that they might be left alone and vulnerable due to unexpected situations, and that they need to know how to survive. 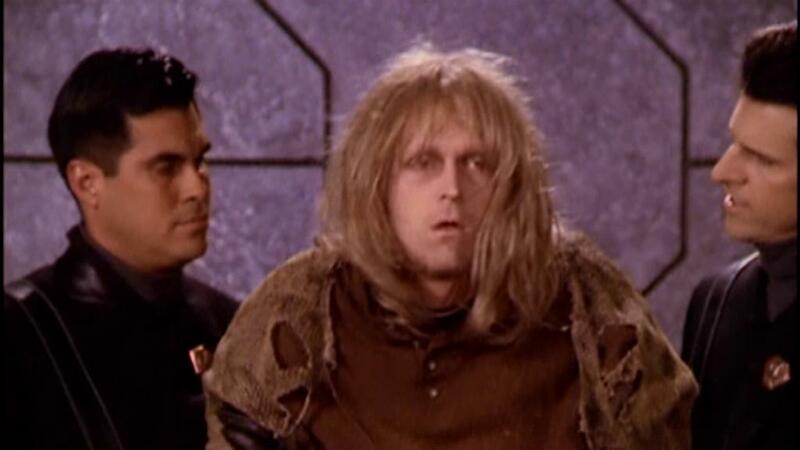 Later, Montoya sends trainees Lennier and Findell on a training mission through an asterioid field. Montoya has placed 39 homing devices among the asteroids, and each Ranger needs to destroy at least ten of these. Someome will fall short of this goal. Findell had joined the Rangers because family members had died during the Shadow War. He had entered the order for the wrong reason. Now, facing this challenge, he thinks he will fail. Findell, unable to handle the shame of failure, sets a collision course, but Lennier rams Findell’s craft to avert the collision plan. Back on the Maria, a furious Montoya confronts Lennier and Findell. 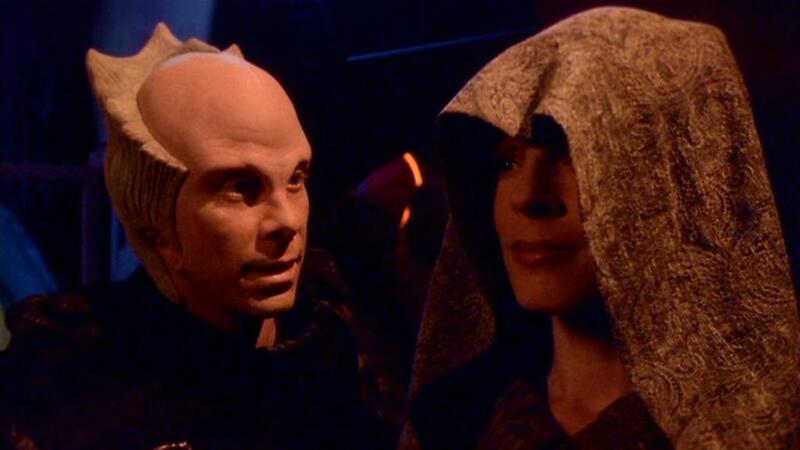 Lennier preserves Findell’s honor with a lie, and the captain reassigns Findell to the recruiting office on Minbar. Findell’s new job will be to question recruits regarding their motivations, and to weed out those with the wrong reasons. Findell, Montoya says, is well suited to that task. Then the captain, who knows that Lennier was lying to shield Findell tells Lennier not to assume that another person cannot listen in on a private channel. 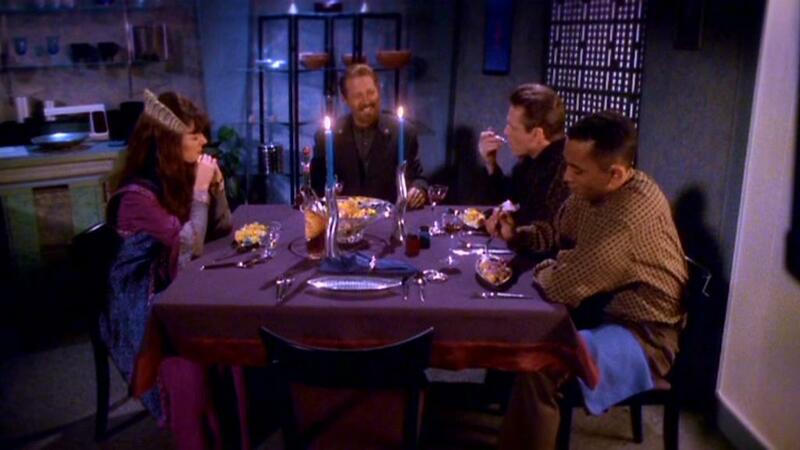 Over dinner, Sheridan, Delenn, Zack Allan, and Dr. Franklin laugh about Vir’s episode with the Drazi merchant. Then they discuss a serious matter: they have about a month to resolve the crisis regarding attacks on shipping before the Interstellar Alliance falls apart in the context of a war. And they wonder where Michael Garibaldi is; he was supposed to be there. Garibaldi is in his quarters, drunk, singing to himself, and ordering pizza. The experience of watching these final episodes again, after a prolonged absence away from them, has been both rewarding and bittersweet. They age well, but I want more of them. Yet the knowledge that filmed Babylon 5 is over helps me savor what is available to me. I have chosen to avoid the Thirdspace and Legend of the Rangers TV movies, for I cannot say much kind about them, and I prefer to maintain a positive tone on this weblog. 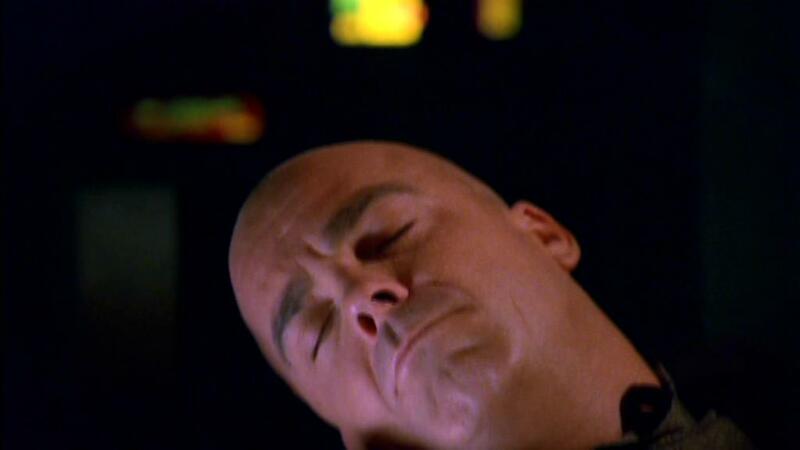 On the other hand, think about all the positive statements I have made about the Babylon 5 saga. 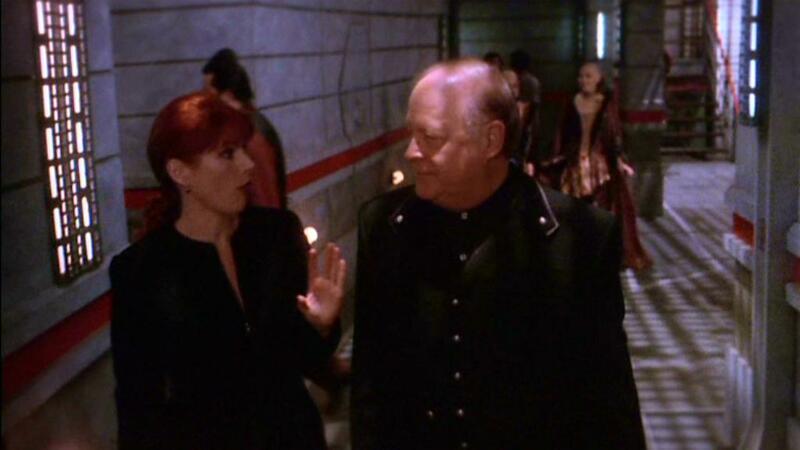 The final season of Babylon 5 had room for some stand-alone episodes. Among these was The Corps is Mother, The Corps is Father, an intriguing look inside the Psi Corps, an organization John Sheridan described as “Fascists ‘R Us.” All human telepaths must either join Psi Corps, which becomes their new family, or take sleeper drugs, which suppress telepathic abilities, cause anguish, and lead sometimes to suicide. 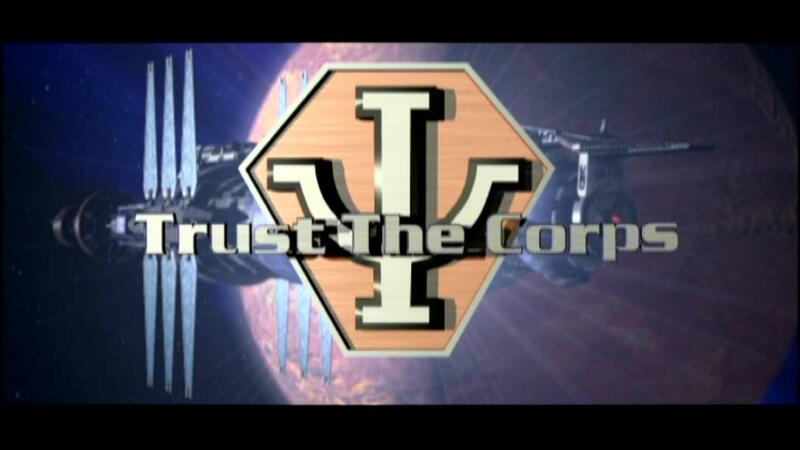 The Corps is the shadow government of Earth, and many, if not most, of its members think themselves superior to “mundanes,” or the rest of us. They are glad to meet their hero, about whom they have heard so much. Bester, as they understand him, is a great defender of telepaths against mundanes. Lauren and Chen are sincere young telepaths. Both are confident, although Lauren has the creepy combination of a sweet disposition, a cheerful demeanor, a superiority complex, and the willingness to kill. One wants to like her, but…. Bester shows Lauren and Chen training for field operations. The two young men pictured above are taking turns scanning and blocking each other telepathically. Bester says that it is difficult and painful, but one must care deeply about telepaths to endure such training. The job a Psi-Cop entails bringing in rogue telepaths, for their own good, as the Corps understands it. 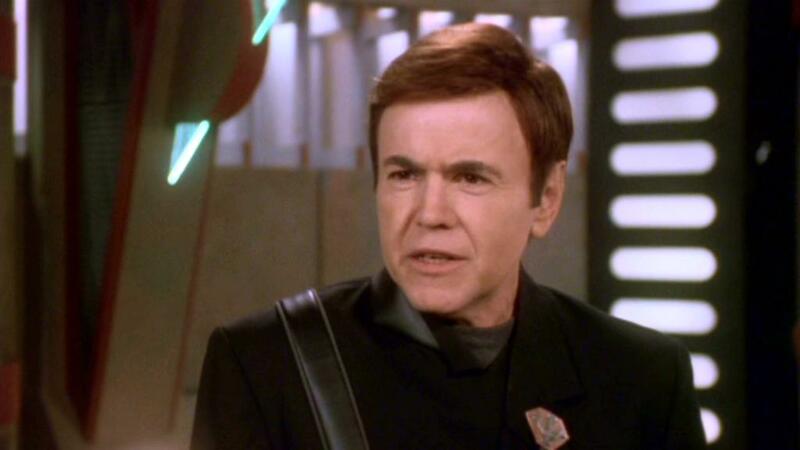 Bester must cut the film experience short because a trainee, Jonathan Harris, has murdered his roommate and fled to Babylon 5. So Bester takes Lauren and Chen with him to see the crime scene. The next day, they travel to the space station, where Bester receives his usually chilly reception. 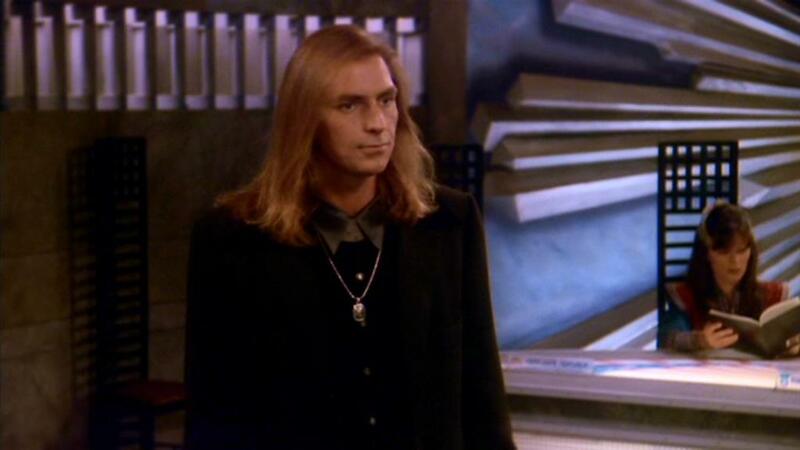 Before they depart for Babylon 5, however, we see Bester in his civilian clothes. He has a disabled hand, which he keeps gloved, even at hand. Lauren, who has a crush on Bester, visits her hero. Yet Bester declines the romantic offer. The woman he loves is elsewhere, he says. 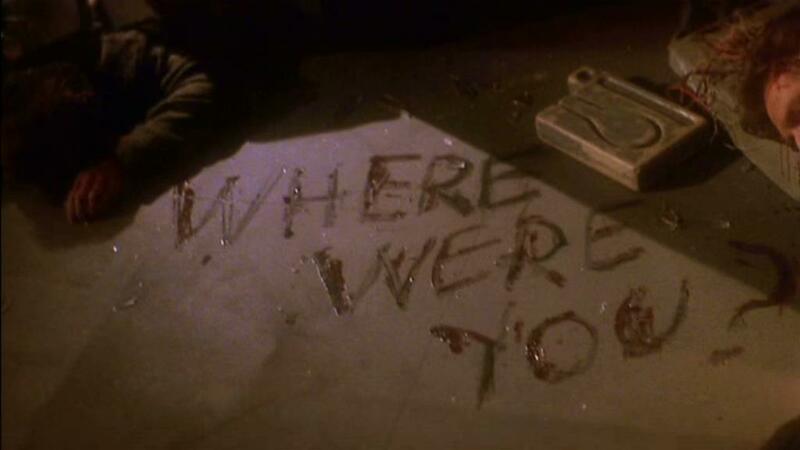 We observant viewers of the series know that he means Carolyn, who still has Shadow technology implanted inside her. Harris is the one on the right. 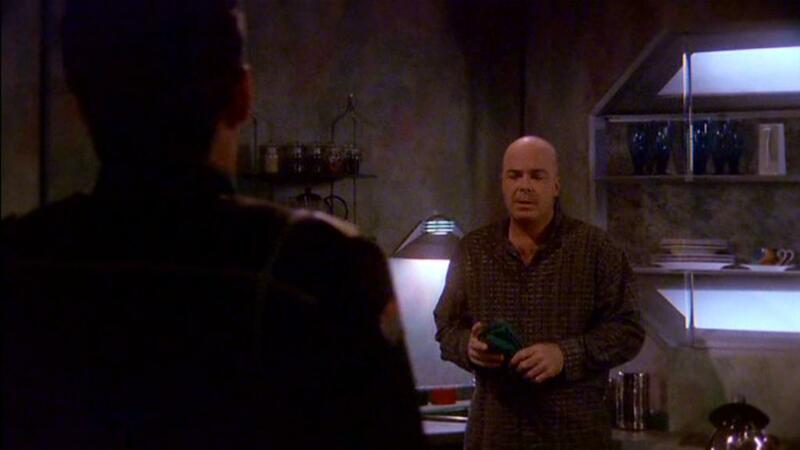 Harris, who has arrived at Babylon 5, raises quick cash by gambling. This is no contest for a telepath, so regulations forbid them from gambling. But Harris does this anyway, wins much money, and shares some of the funds with one of the denizens of Down Below. Even his partner knows that Harris is unstable, though, for, as Bester determines, Harris has two personalities. 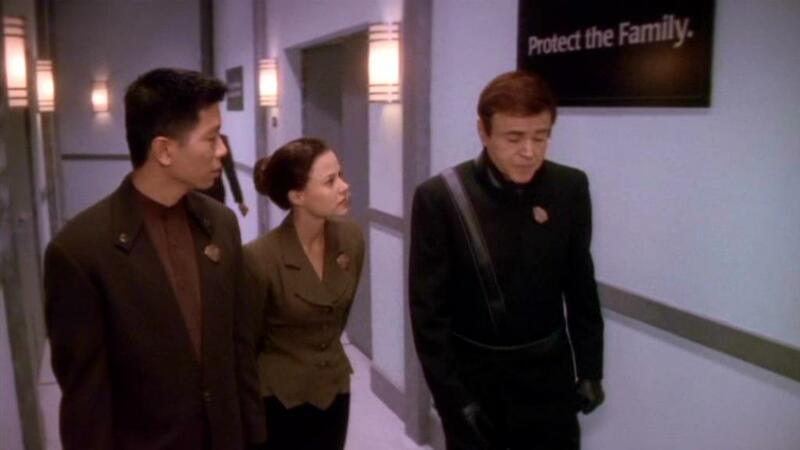 Bester tells Lauren and Chen to explore Babylon 5, but not to confront Harris. Chen does find the unstable telepath’s partner and tries to call Bester, but the partner kills him. A security camera does record an image of the assailant’s tattooed hand, however, so station security personnel can track down the killer. Bester has contempt for mundanes. Station security personnel also capture Harris. They release both prisoners to Bester and Lauren, who take their sedated captives away. 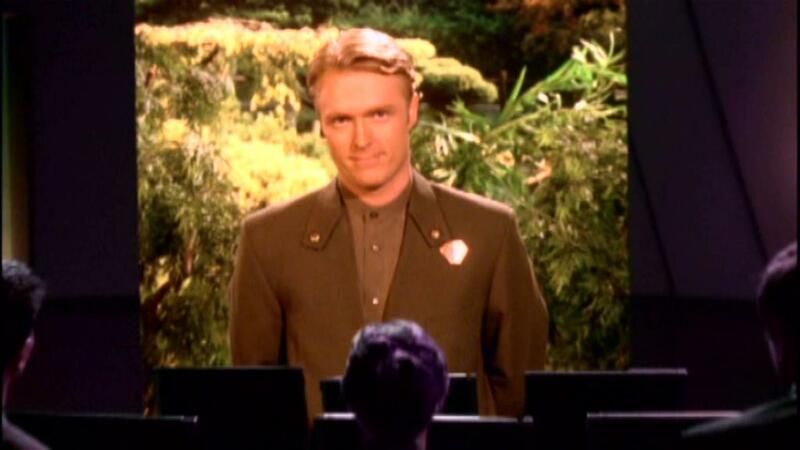 The Corps will put Harris away “for everybody’s good,” because he is an unstable telepath. The mundane dies of exposure to hyperspace, however, for the Corps metes out rough justice to those who kill telepaths. Bester grants Lauren’s request to space the mundane. Bester asks if this her first time killing a mundane. 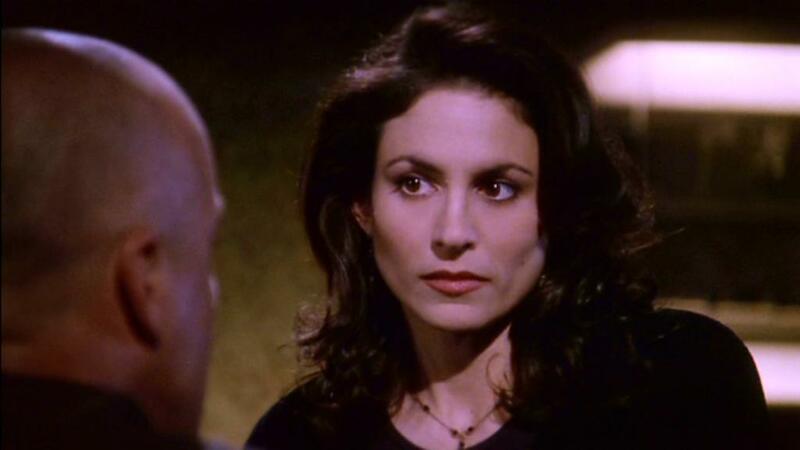 Lauren indicates that it is, and the senior telepath says that she just might be Psi Corps material. Lauren is happy. 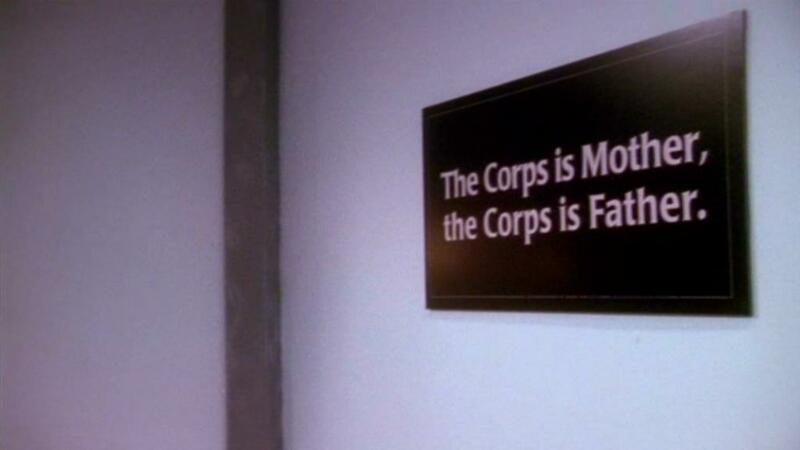 So now we know in full how contented members of the Psi Corps see themselves. Series creator J. Michael Straczynski has stated that a villain does not see a villain when he looks in the mirror. Thus his antagonists are not cardboard cutout figures or moustache-twirling antagonists. Rather, they are characters who perceive their cause as righteous. And so they are interesting, if still disturbing. Michael Garibaldi has a drinking problem. Much of U.S. television is episodic. Characters do not really change much over time, there are few problems one cannot correct inside one episode, and nobody learns anything more profound than fortune cookie wisdom. (Think of the most notorious Mike Brady speeches from The Brady Bunch.) All this makes it easier for viewers to understand a series, but it also makes for unsatisfying television. 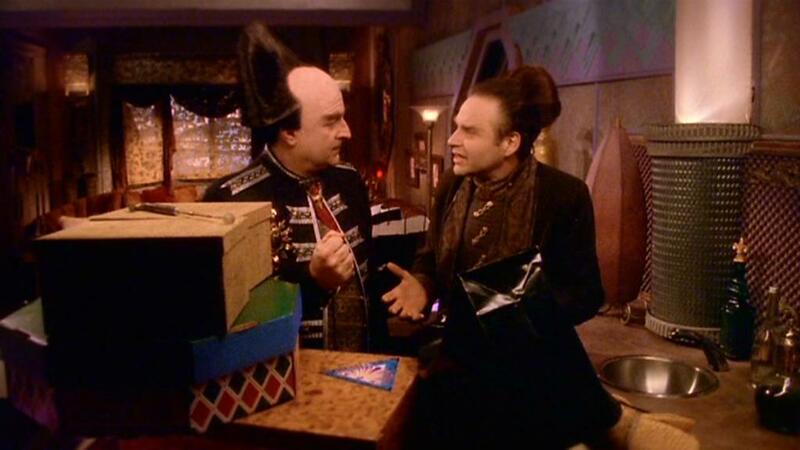 Then there are series such as Babylon 5, with few stand-alone episodes. The stories are serialized, characters change, and keeping up with the show becomes more satisfying over time. On the other hand, a neophyte coming in late is lost easily. Perhaps reading summaries and reviews, such as these, helps counteract that problem. The Ragged Edge contains stories of two characters who have changed much over the run of the series, and who have surprises left within them yet. 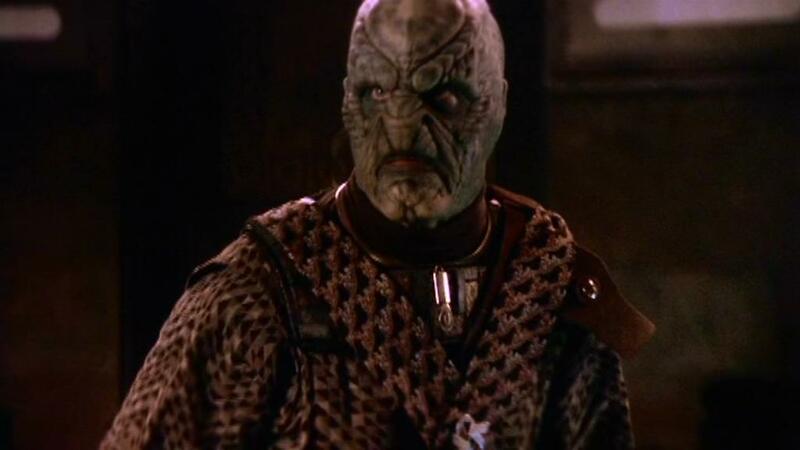 I begin with G’Kar, Ambassador from Narn. He and Londo Mollari return after their nearly month-long visit to Centauri Prime, and Narns throng around G’Kar and bow to him. During his time away, some concerned Narns took the book he had been writing for the last few years and published it. The Book of G’Kar is a bestseller, and the once-bellicose ambassador, now a peacemaker, has become an unwilling religious figure. 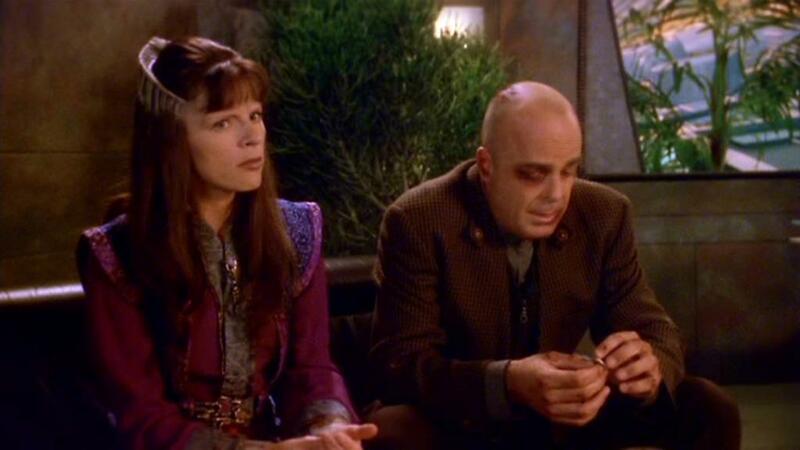 G’Kar cannot get away from the religious pilgrims, who seek religious instruction. 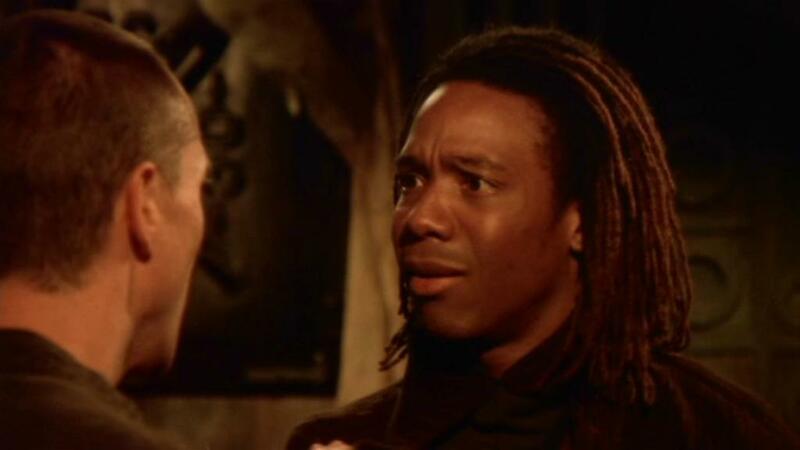 Ta’Lon talks him into providing it, and G’Kar has to teach one anxious learner to read passages of the Book of G’Kar in historical context. Fundamentalism is still a force to counter, even in 2262. 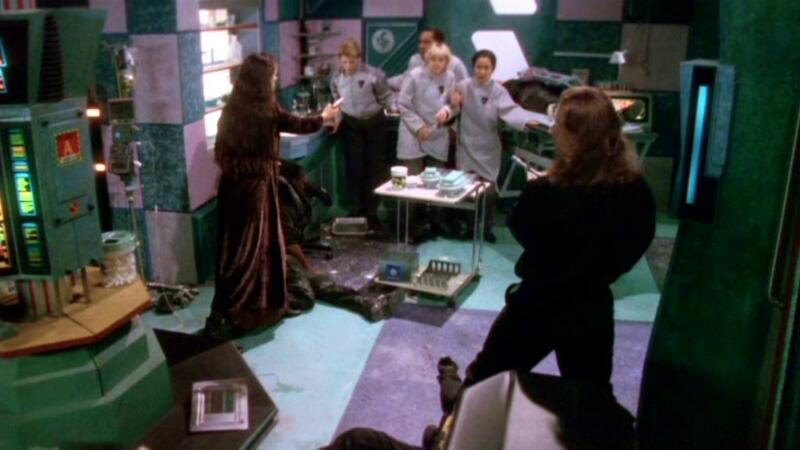 Meanwhile, Sheridan and Delenn must contend with the fact that most members of the Interstellar Alliance council refuse to meet until they can either guarantee the safety of shipping lines or identify who is responsible for the attacks. Sheridan and Delenn have a lead based on a recent attack. The ship was smuggling illegal items at the tacit behest of the Drazi government, so the Drazi will not assist the Alliance. Michael Garibaldi is late for a meeting with other key Alliance personnel, for he has resumed drinking to excess. For Garibaldi, an alcoholic, there is either no drinking or there is drinking to excess. He is also the head of Alliance Covert Intelligence, so his drinking is even more dangerous than it would be otherwise. But nobody else knows about this recent development yet, so Garibaldi goes about his business, for now. Garibaldi travels alone to the Drazi homeworld to meet an old friend and contact, Tafiq Azir. Sheridan prefers that Garibaldi travel with Dr. Stephen Franklin, but Garibaldi says that Azir will trust him, not anyone else. Franklin suspects that something might be wrong with Garibaldi, who once helped him through an addiction problem. But, for now, the spy master is bluffing well. Azir knows what Garibaldi needs to know, which is that the Drazi government is willing to kill in order to keep secret its role in smuggling. Then Azir and Garibaldi begin to drink, and Drazi agents assault Azir and Garibaldi and kill the former. Some hooded figures (not Drazi) assault the drunk Garibaldi further in a narrow street, but the spy master collects a button which fell from the garment of one of these individuals. It is a button worn only by guards at the Centauri royal palace. 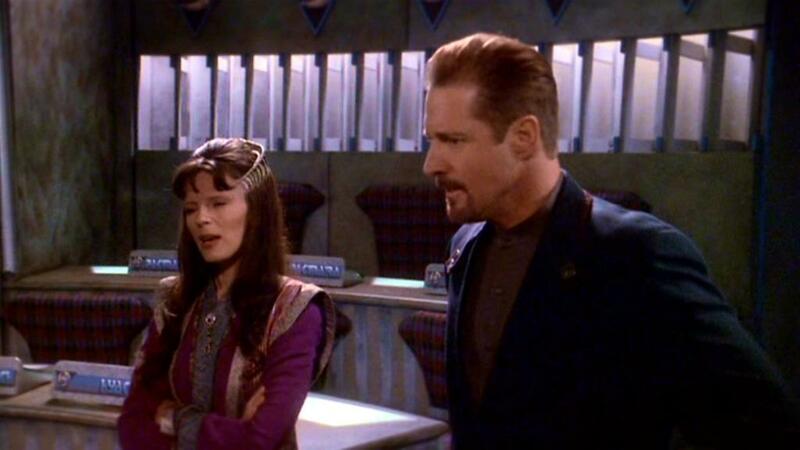 Garibaldi returns to Babylon 5, where he briefs Sheridan and Delenn. There is a leak, and they know that it is Londo. 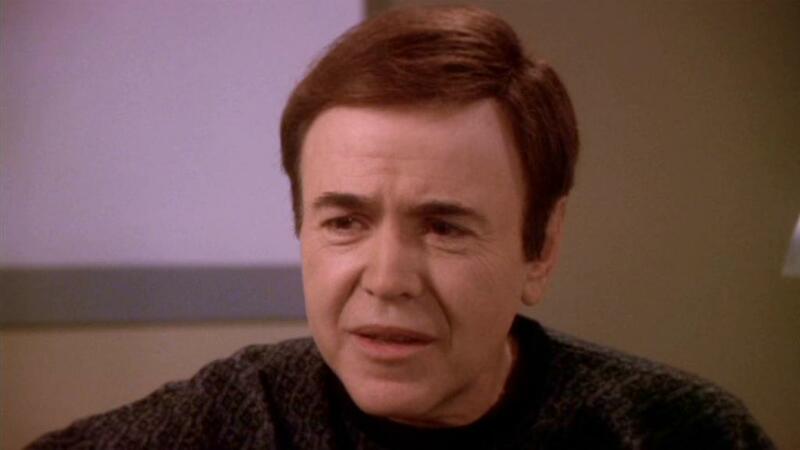 The Centauri Ambassador is a member of the inner circle of the Alliance, but now he must be out of the loop. In other developments, Dr. Stephen Franklin decides to accept a new job at year’s end. He will become the head of xenobiological research for the Earth government. Franklin informs President Sheridan in person then rushes off to call Garibaldi. But Garibaldi does not hear the incoming call because is passed out, drunk. If you have uneasy feelings about the results of Garibaldi’s drinking problem, you are correct. And don’t worry about G’Kar. He is centered, and will be fine, after some more stress. As for Londo, he is the most unfortunate individual of them all. Finally, Dr. Franklin will be fine, too. Keep reading and stay tuned! I have noticed that many online reviewers of the fifth season episodes display a high degree of open hostility. There is an unfortunate tendency among many to be needlessly rude about minor matters online, and some of the reviews I have read match this descriptions. Babylon 5 is a television show. It is entertainment, not the end of the world. I like it very much, but I have well-placed priorities when considering the relative importance of matters. That said, I think that the rogue telepaths storyline from the first part of the fifth and final season is quite moving. These are people whom others have made to feel more than unwelcome, and all they want is a place to belong. We are all strangers to someone. And if we live on the margins, it might be because others keep us there. Keeping people on the margins radicalizes them and leads to even more trouble, all of which was avoidable. The events of A Tragedy of Telepaths occur on June 16, 2262. 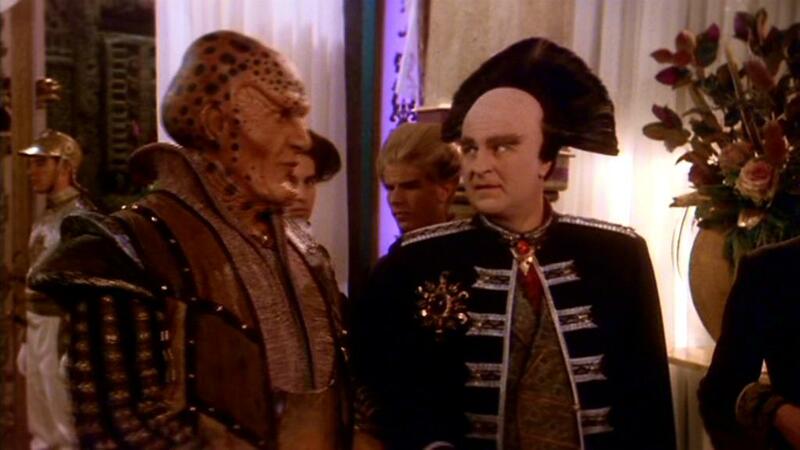 Londo and G’Kar are still on Centauri Prime. 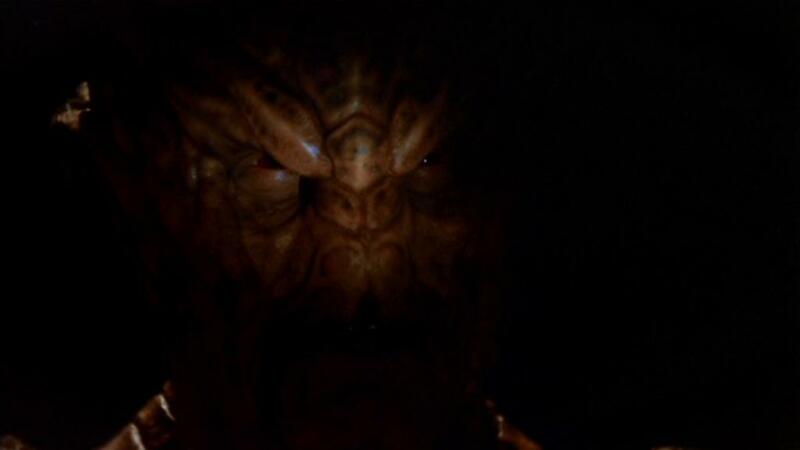 They discover a mostly forgotten prisoner, who is Na’Toth, G’Kar’s aide, presumed dead. The war between the Narn and the Centauri governments is over, yet somebody forgot to free Na’Toth. The royal palace is still a dangerous place, even for Londo, soon to be the Emperor. 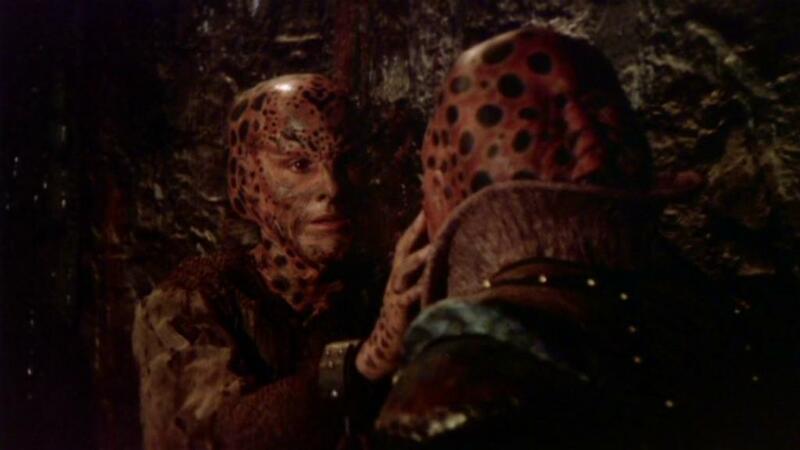 But he and G’Kar discover a way to smuggle Na’Toth onto a ship bound for the Narn homeworld, where she may recover from her ordeal. 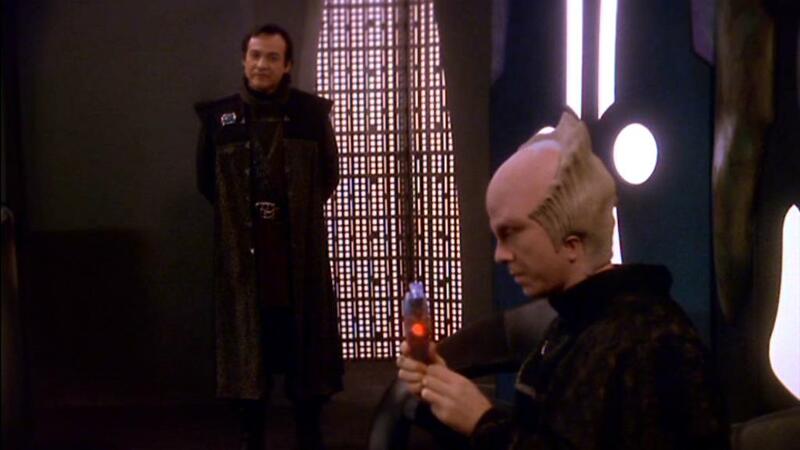 Back on Babylon 5, President Sheridan uncovers a plot (by whom he does not yet know) to divide the Interstellar Alliance. Debris planted at the sites of attacks on ships implicates certain members of the Alliance in attacks on vessels of other members of the Alliance. Sheridan does what he must to prevent war–he sends part of the White Star fleet to keep the peace. This is not a universally popular decision, but it is effective. 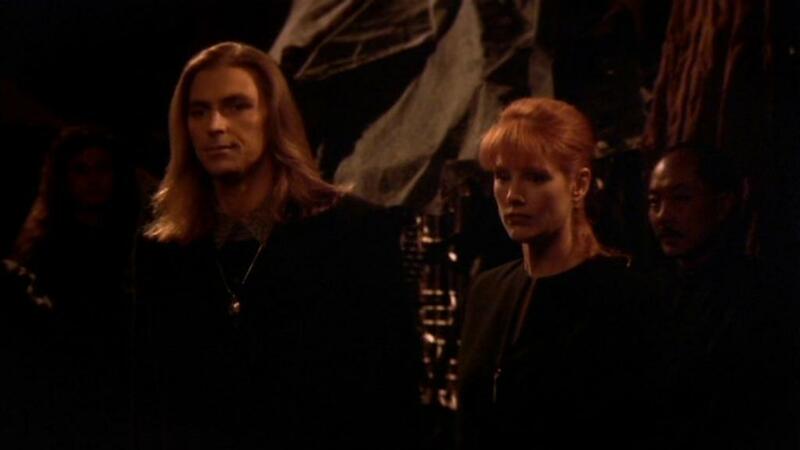 The main story, however, concerns the rogue telepaths, most of which are barricaded on Babylon 5. Now I turn my attention to this series of events. Station security personnel are attempting to cut through bulkheads, behind which rogue telepaths hide. Yet these telepaths can reinforce the bulkheads from their side. And, being telepathic, they can (and do) convince those security personnel that there is a bomb nearby, causing the worker to panic and stop working. Captain Lochley accesses the telepaths by crawling through maintenance tunnels. She tells Byron that the ambassadors were already nervous because of the attacks on shipping, and that his attempted blackmail came at an especially bad time. The telepaths will never get a homeworld now. She encourages him and the others to come out voluntarily, or else people will die. This is an outcome she wants to avoid, if possible. But Byron refuses to leave. He also refuses to identify those telepaths not holed up with him, even those who pose a threat. Byron will not betray any of the telepaths. Bester from Psi Corps arrives. This fact gives no comfort to some of the telepaths not holed up. They attack and kill certain station security personnel. This situation, which has already gone from bad to worse, deteriorates. 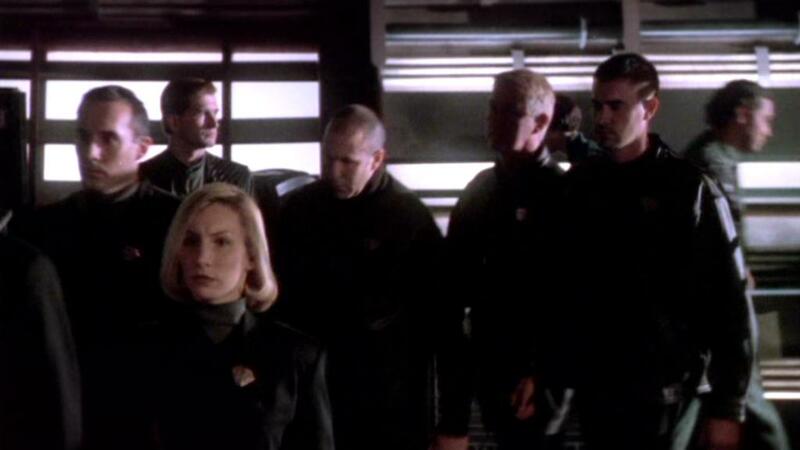 As the episode ends, bloodhound units from Psi Corps begin to arrive on the station. Bester gives them their marching orders. The rogue telepaths are family members, so to speak, so killing them should be a last resort. This instruction flows from a mindset common to many telepaths, which is that they are superior to “mundanes,” or non-telepaths. Bester wants the telepaths rounded up by the next morning, at the latest. 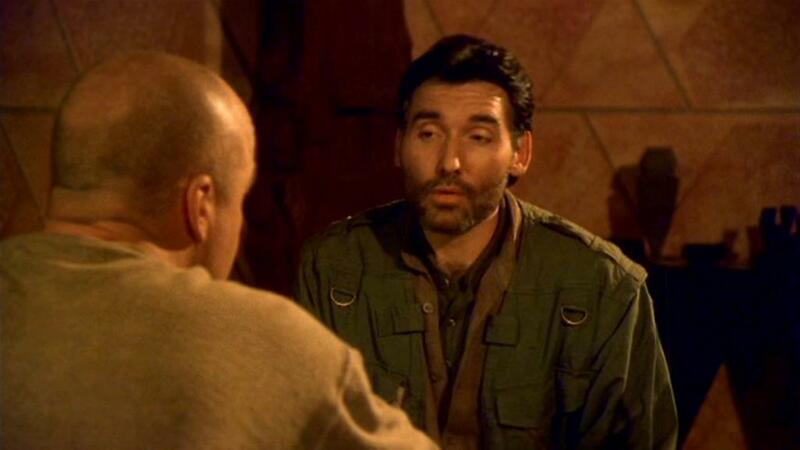 Bester tells Lochley that he is certain he and the other Psi Corps personnel can work something out with the rogues. Lochley is not so sure after she sees the above dead member of a bloodhound unit. Meanwhile, Michael Garibaldi attempts to shoot Bester. You might recall, O reader, what Bester did to him in the fourth season. Alfred Bester is definitely an antagonist and a real piece of work. Despite Garibaldi’s best effort, he cannot harm Bester in any way, actively or passively, because Bester has placed a neural block inside Garibaldi’s brain. “How stupid to you think I am?” Bester asks Garibaldi, now feeling angrier and more helpless than ever. Some of the rogue telepaths roaming the station resort to terrorism, taking hostages in MedLab. President Sheridan refuses to negotiate with terrorists, but Byron and Lyta end the situation by escaping their hole the same way Captain Lochley got in. Byron and Lyta make their way to MedLab, where Byron shoots the lead terrorist. 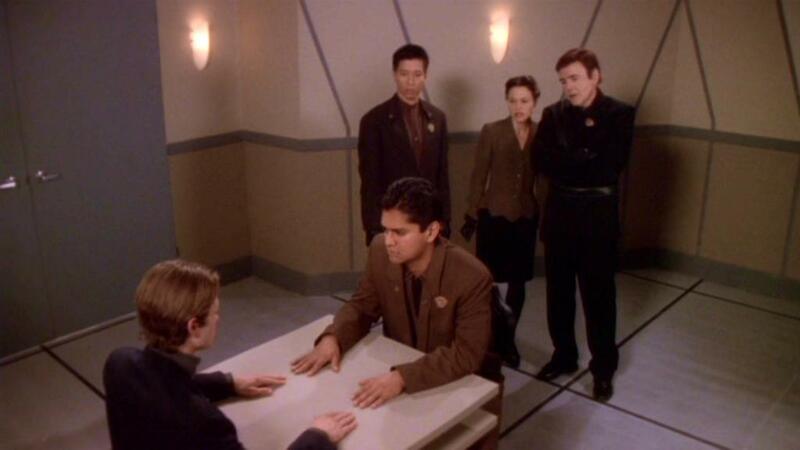 Byron contacts Captain Lochley, who now has jurisdiction over the matter because the Earth government says she does. So Bester and his people have to take orders from Lochley now. Byron offers to turn over those of his people who committed violence and asks that those who refrained from violent acts be allowed to leave. Lochley agrees. Yet Bester has a personal stake in this matter. Byron had been one of his proteges. Years ago, when Bester and Byron were part of a Black Omega squadron which intercepted a ship ferrying rogue telepaths, Bester gave the order to destroy the ship after the removal of the telepaths. This was to make an example of those “mundanes.” Byron hesitated then opened fire, but he felt guilty afterward and left Psi Corps. 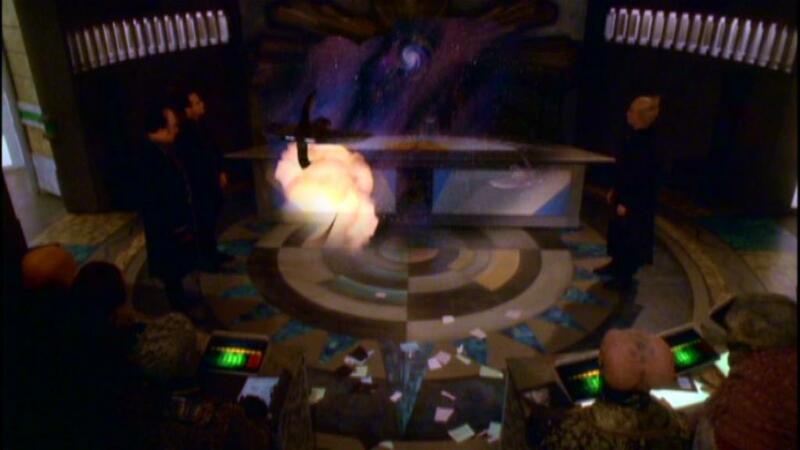 As the innocent telepaths prepare to leave Babylon 5, Bester interferes and creates an incident which leads to gunfight and the release of fuel. Byron, aware that his dreams are dead, stands with the surrendering telepaths, and ignites the fuel, but not before all other people flee the scene. 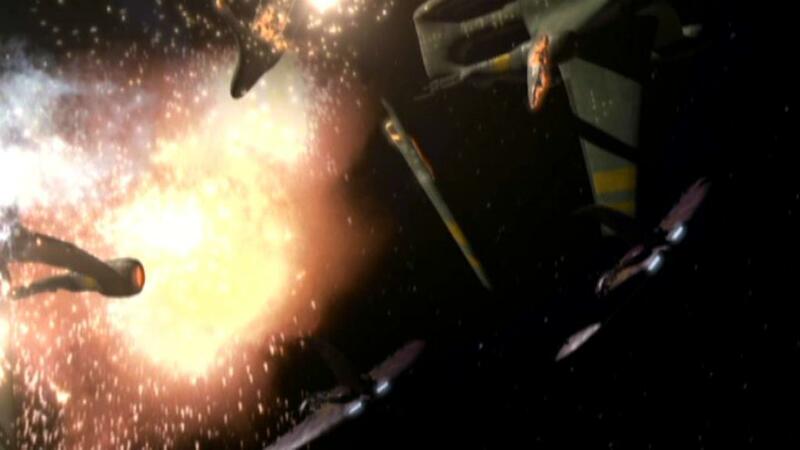 The plot thread about Garibaldi falling off the wagon plays a pivotal role in the next episodes, and the bombings of Psi Corps targets continue, as well. Lyta is involved in these, as she is now a committed revolutionary. There are 110 episodes of Babylon 5; Phoenix Rising is the 99th. There is much territory left to cover, especially with regard to the Londo Mollari character. Hang on, for the ride is intense. Dangerous aliens stalk the Centauri royal palace. 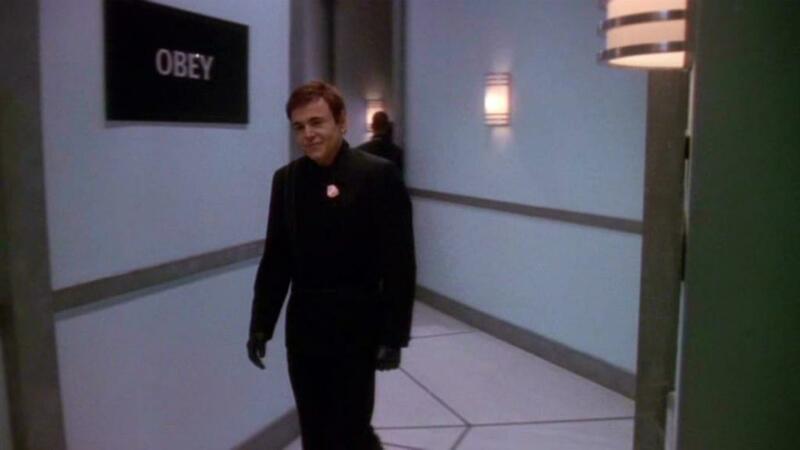 In the Kingdom of the Blind is the creepiest Babylon 5 episode to this point. Strange and menacing aliens lurk in the shadows at the Centauri royal palace, where politically convenient murders occur. These aliens say nothing, and we hear about them in third person plural pronouns. “They say….” But who are they? If you have been paying attention, you know that these are former agents of the now-departed Shadows. 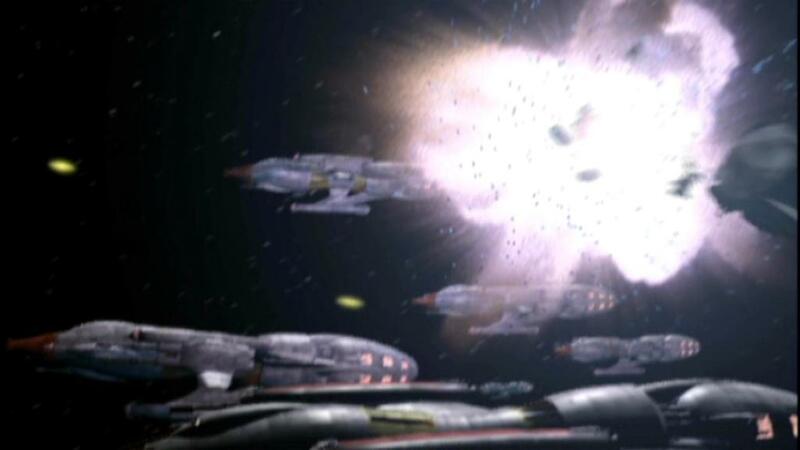 The Shadows left the galaxy at the end of the Shadow War, during the fourth season. Their servants have relocated to Centauri Prime. And Byron is about to demand that the Interstellar Alliance grant the rogue telepaths a homeworld. If the Alliance refuses, there will be consequences. This doesn’t look good, either. So let us begin in earnest. 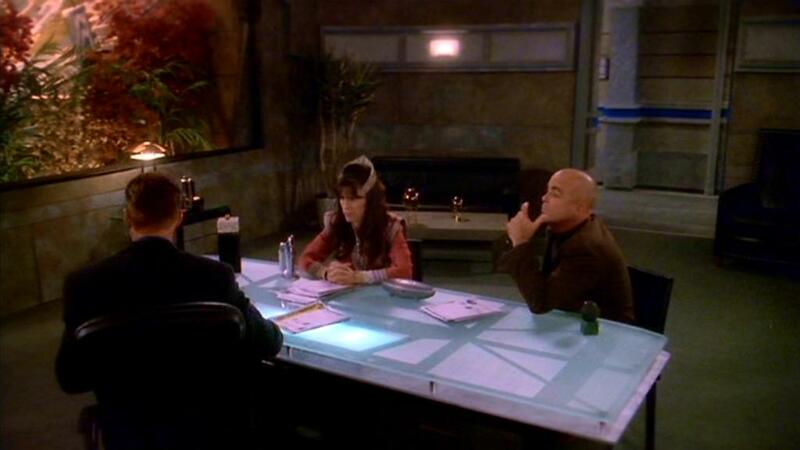 Mr. Garibaldi, Delenn, and President Sheridan are discussing the continuing attacks on ships of Interstellar Alliance member worlds. Everyone has taken at least one hit, and those attacking the shipping lines do so at random, leave no witnesses, and take no cargo. These are not raiders; they are terrorists. Sheridan, who knows that member world governments will blame each other, assigns the White Star fleet to guard major shipping lanes. Byron addresses the ambassadors to the Interstellar Alliance. He shares what he knows about Vorlon meddling, leading to the creation of telepaths. Then he demands a homeworld for telepaths. President Sheridan, aware that this was Byron’s stated reason for asking to address the council, declares Byron out of order. Then Byron reveals the fact that he has had telepaths collecting the ambassadors’ secrets, and that they will reveal them unless the Alliance grants the demand. This strategy constitutes a major miscalculation. Now everyone fears the telepaths, Sheridan withdraws his protection of them, and Security Chief Zack Allan orders the telepaths who have barricaded themselves in Down Below to surrender. But some telepaths, bent on violence, have fanned out across the station. 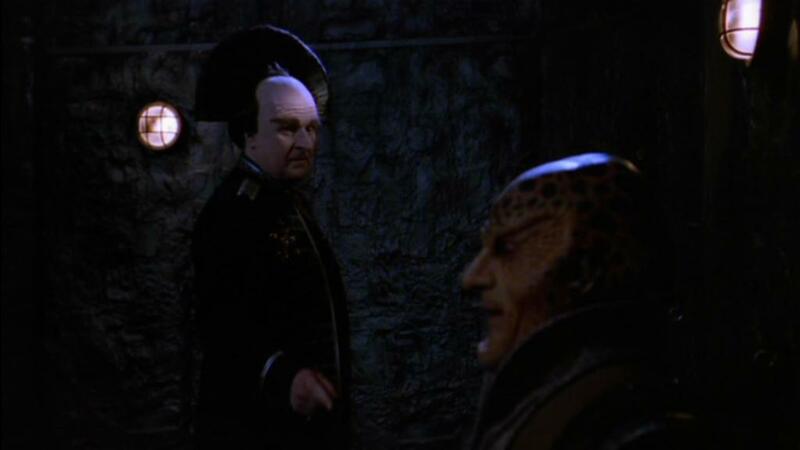 Londo Mollari has returned to Centauri Prime in the company of G’Kar, functioning as bodyguard. This is a great offense to many and a novelty to some, but it means continued life for Londo. Lord Jaro, an old friend, informs Londo that the royal palace is both quieter and stranger than it was under Emperor Cartagia’s regime. Government reports about agricultural production are not top secret, and the military budget has ballooned despite the fact the Centauri Republic is not at war. 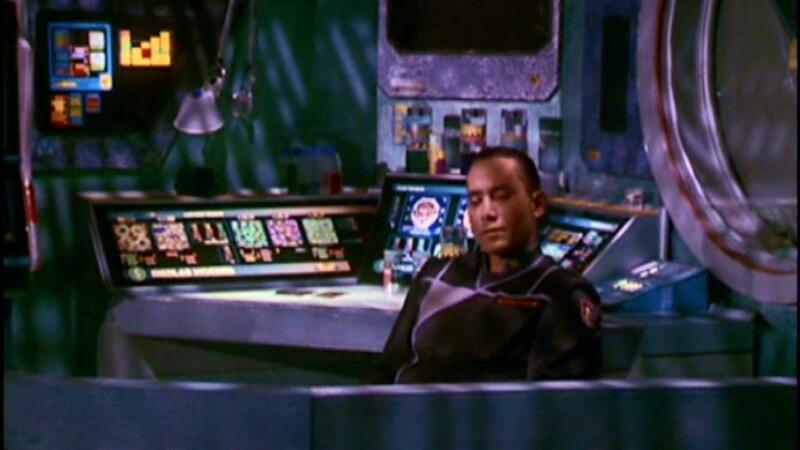 Regent Virini, whose only vice (according to the Centauri) was his sobriety, has been drunk quite often recently. Sometimes, late at night, he has claimed that he was not himself and asked palace guards to kill him. Lord Jaro dies that night. It is murder despite the fact that someone tries to make it look like suicide. Lord Vole, who has designs on the throne, attempts to assassinate Londo, but the knife he throws at Londo hangs in mid-air before reversing course and killing the assailant instead. Then Londo turns and sees a red-eyed alien standing silently in the darkness. 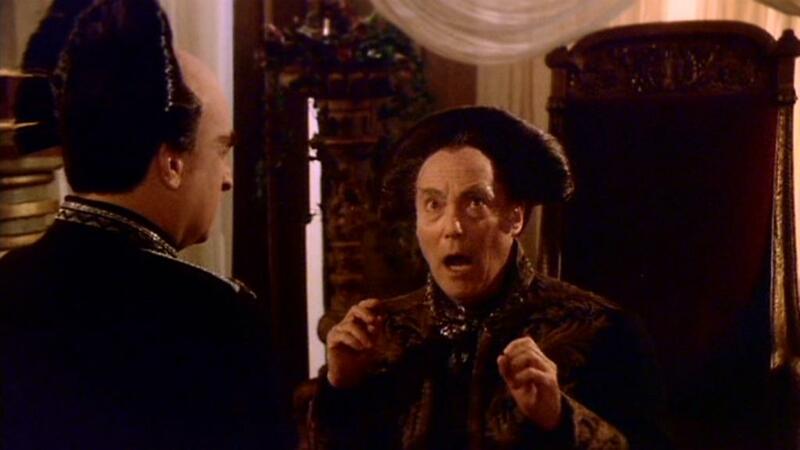 Later, Londo encounters Regent Virini, who indicates without saying much that something is very wrong. “They” like Londo. “They” think he is very much like “them,” so “they” have saved his life. Londo will be Emperor soon, so he should enjoy life while he can, and he should leave now, the Regent says. Londo takes the hint. That evening, Londo sits up sleepless in bed (with G’Kar keeping watch) wondering what “they” are doing with Centauri ships. At the same time, somewhere in outer space, a Centauri battleship an unarmed transport vessel. Only bad can come from this. The pieces are beginning to come together, but I choose to hold off on completing the puzzle until the appropriate time. Do not worry or be concerned though, for that time is only a few episodes away. Thanks for reading. And I encourage you watch the episodes, of course. They are available through more than one legal venue.